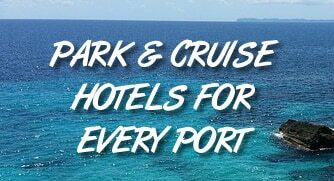 The cruise port in Mobile serves as a perfect location for those in the southeastern United States looking for a quick getaway without having to make their way all the way to New Orleans or ports in Florida. And while no one would ever mistake Mobile’s operations with the major cruising ports seen in other cities, it does offer a convenient location with a newer terminal and regular cruises to points in Mexico. Today you can sail year-round from the city aboard Carnival, with a schedule of 4 and 5-day trips to Cozumel, Costa Maya, and Progreso. If it’s your first time sailing from Mobile, then you likely have a few questions about your cruise… how to get there, where to park, where to stay, and even more. So to help you get started, we’ve covered the basics of the port to give you a better idea of its location and layout. The links below should also help you answer some of the common questions about sailing from the port. The cruise port is situated on the western bank of the Mobile River, due east of the Mobile Civic Center and at the edge of downtown. While most cruisers drive in for their trip, the cruise port is about 15 miles (25 minutes) from the Mobile Regional Airport. If coming from points further, the port is roughly two hours and fifteen minutes drive from New Orleans and 2.5 hours from Montgomery. Right now Mobile services only one cruise ship, which makes it easier to navigate on cruise day than busier ports in Florida. Parking is right at the cruise terminal, making it extremely convenient to get to the ship.